Puchong, 21 June: A battle is brewing between top pro-Tun and pro-PM cyber critics. Tun Mahathir's top blogger Syed Akbar Ali has been challenged by Lim Sian See, one of Najib's most abled online defenders, to a duel for truth and honour. 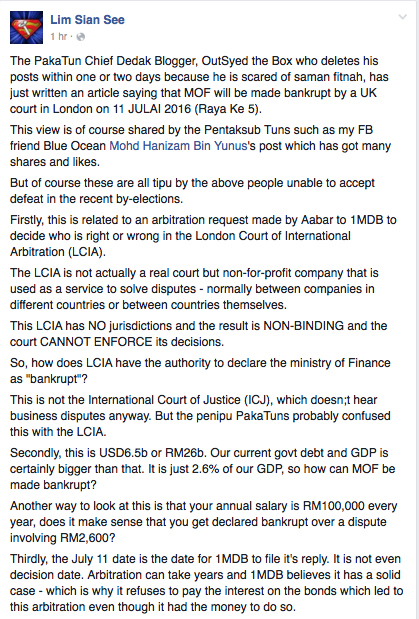 Basically, LSS is accusing Syed Akbar of lying again in his latest posting on the Aabar vs 1MDB arbitration. Syed Akbar purported claimed that the MoF will be declared bankrupt on July 11 as a result of the dispute. LSS says "... it is clear that the PakaTun penipus continue to take advantage of their followers ignorance with propaganda lies such as this ... in time for Raya hoping the people will gossip about this in the kampung while eating lemang". 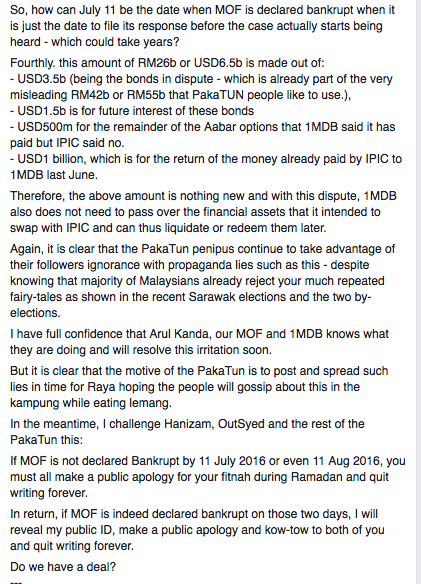 If MOF is not declared Bankrupt by 11 July 2016 or even 11 Aug 2016, you must all make a public apology for your fitnah during Ramadan and quit writing forever. In return, if MOF is indeed declared bankrupt on those two days, I will reveal my public ID, make a public apology and kow-tow to both of you and quit writing forever." Exciting lah. 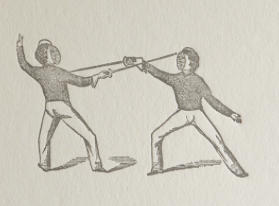 But I doubt you'll have a deal (or duel), LSS. Apa bangang sangat Datuk LSS tu? Itu komen dari pembaca lah yang Syed published. Bukan dia yang tulis. RM26 billion tu nanti sapa yang nak bayar? first of all,lss should show his true self just like those he challenged. it would be fair that way if he is serious..
Yang memfitnah orang Islam dan difitnahkan orang Islam, tak malukah orang bukan Islam yang pertahankan. Antara yang nama Islam itu mungkin Islamnya sesat kot ... Padan dia melakukan sesuatu yang jelas dimurka tuhan.. Konon hanya percaya Quran. Good to see Lim Lan See, Eric, dragging Ramadan into this. Let me check with my rich MCA Datuk sugar daddy what the correct plotocor is, before my crappy little IT company goes off to lick up more gomen kontrak dedak. Wa mikin deal sama lu, lah. Lu soolah katak itu alblitation can take years, betui tak? I'll bet the entire lucrative love triangle between your indirect paymaster, Jho Low and the 2 Aabar Arabs leads to prosecutions before that. I doubt that IPIC's lawyers are that stupid that they haven't taken into account all the possible outcomes of the referral to arbitration. Maybe LSS is harbouring a faint hope that IPIC's lawyers have committed a boo-boo. You might want to ask if the agreement between IPIC and 1MDB which may include a provision for mandatory arbitration also includes a clause that the results of said arbitration are binding on both parties and cannot be appealed. So, hold your horses until the arbitration proceedings commence in London. And if 1MDB didn't take this seriously, why would they engage a high-powered team of foreign lawyers to argue their case in front of the arbitration tribunal? Surely there are a number of good arbitration lawyers in Malaysia whose services could be availed of? Aren't they? Why go offshore for expensive legal expertise which will have to be paid by 1MDB? Whoever this LSS is, he needs to understand the meaning of the word bankrupt before issuing the challenge..
actually all no need to know who is lim sian see aka lss aka lu sian see meaning translated from hokkien lu is you sian is first see is die so is like you die first. The latest on the Tun's hate list! Singapore's MAS tells WSJ: No such thing!